HealthVib® inseat is based on HealthVib® WBV standard measurement system. HealthVib inseat system consists of the sensor with wireless transmission of vibration data to Vinindicator which stores and presents simultaneous vibration data for the operator. Data can be stored up to 30 days and exported to the software CVK VibView™ ™ inseat light for further analysis and reporting. 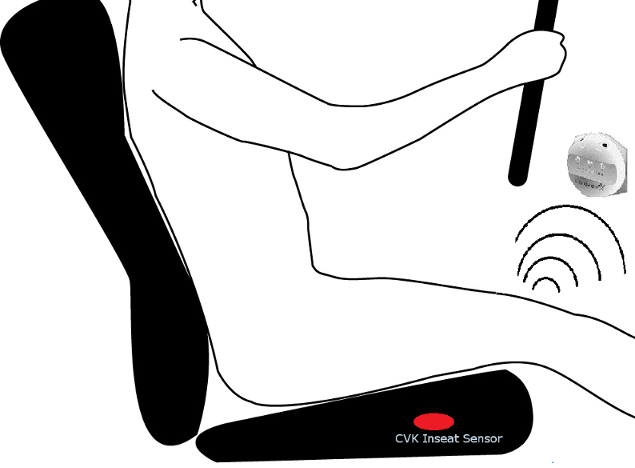 CVK HealthVib inseat can be mounted under sates cushion or chair. HealthVib inseat system can be purchased with driver’s seat (or passenger seat) or be mounted later on. HealthVib® WBV inSeat system consists of an electronic card with a sensor, Vibindicator ™ WBV inSeat and CVK VibView™ inseat ™ software analysis. InSeat system is based on HealthVib WBV standard measurement system, ie, measure and analyze whole-body vibration in three directions in accordance with the guidelines in ISO 2631 and the EU directive 2002/44 / EC (AFS 2005: 15). HealthVib WBV Inseat sensor is wirelessly connected to Vibindicator WBV Inseat to store data and simoultaneous presentation of a dominant direction, the current and cumulative exposure to vibration. This feature reveals the vibration source and the cause. Therefore, it is easier to chose the best preventive measure. CVK VibView™ Inseat Light is to analyse stored data from Vibindicator WBV Inseat. The stored measurement files are listed and it is easy to generate a report. Up to 30 days of measurements can be analysed and reported. Vibindicator™ WBV Inseat features and stores results from HealthVib® WBV InSeat™. The presentation takes place by means of colored diodes and continuously updated to simultaneously display the current vibration exposure. This feature allows the driver noticed and warned of harmful vibrations, and thus can be the best preventive taken and implemented. Vibindicator™ WBV is wirelessly connected to HealthVib WBV and placed in a suitable location in the driver’s environment. Vibration data from Vibindicator WBV inSeat are exported very easily. Vibration data up to 30 days can be exported and analyzed with software CVK VibView™™ InSeat light.